With just days to go till the latest installment of Toy Story hits the UK theatres, you may not be surprised to find that hot on the tail of the films release is the video game. Licensed titles are always approached with caution, many of them can be rather cheap tie in’s with by the numbersplatforming or just overall charmless gameplay. On top of that its a multformat title and (as most Wii owners will testify) when it comes to games with multiple releases normally the Wii version of such titles tends to be the most disappointing. However this one turns out to be a pleasant surprise. Now it should be stressed to anyone considering picking up this title on Friday before seeing the movie next week, the games hub sets itself after the events of the movie, and as such, just playing the game is a giant spoiler in general for the movie. Basically this game is designed for play after you’ve seen the film – its worth holding off as the levels tie into the movie in an interesting way without being a tired retelling of what you already saw. This review will be spoiler-free however. 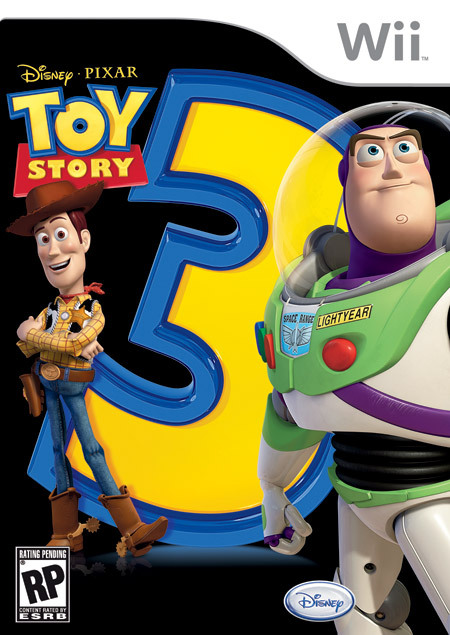 The game offers 3 playable characters thoughout the game: Woody, Jessie, and Buzz. For the most part the characters are the same, though they have a few unique abilities or special areas only they can reach in the game. For example, only Woody can use his pullstring to swing across using hooks, and only Jessie can make super-precision jumps on certain objects like pins in a wall. Some levels allow for choices between the 3 and others will exclusively use a single character due to the story or location. There’s 2 main modes to play though – the traditional story mode which is your standard platforming romp or “Toy Box” mode – a “sandbox” mode with various large areas that players are welcome to roam and customise. The story mode is pretty much what you expect it to be in terms of platformers. With all the run and jump action and mini-game action thats usually part and parcel of such titles. Along with the platforming there’s also puzzles and challanges to complete – this ranges from the usual collecting of items to more unusual things like guiding parachuting army men to targets. Graphically, the game is a little rough-looking due to the graphics being a port stepdown from the HD console versions, but it’s a small price to pay as the game itself is pretty much like it’s HD console brothers. One thing you might notice is that some voice actors reprise their roles from the movie, yet some of the main characters have different voice actors. For those not a fan of the voices, the playable characters thankfully dont quip too much. Additionally most of the music is based off the original soundtrack so it fits in with the feeling of the movie as well. The only problem is that this mode is short, its about seven levels long and while they are quite big levels it’s easy to complete the game in just one sitting (as I did). Though the game is clearly aimed at a younger audience, it’s still more fun than other licensed children’s games. Players can always go back to collect the trading cards and tokens hidden in the levels if they wish… or they can move onto the much-hyped attraction of the game, the “Toy Box” mode. Overall, Toy Story 3 is a fairly fun family game with low thrills. It won’t win any awards for originality (though the Toy Box is a neat use of large gaming environments), and it’s not as long as the 60+ hour epics some gamers have come to expect, but what it lacks the game makes up for with buckets of charm that’ll leave most people with a warm fuzzy feeling without outstaying its welcome.